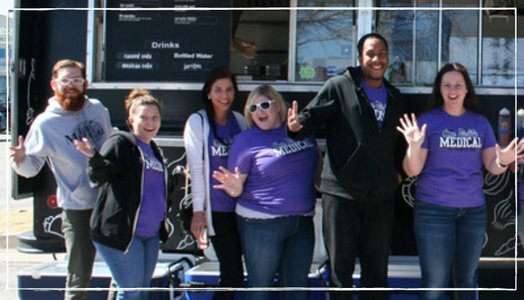 180 Medical is a national supplier of ostomy product, intermittent catheters, and related medical supplies, and we make it a point to hire positive, compassionate, hard-working individuals who want to enjoy going to work, not only for a paycheck but for a rewarding place where we can make a difference. We offer a competitive benefits package, extensive training, and many fun extras and perks. 180 Medical was also named one of the Best Places to Work in Oklahoma for the 7th year in 2016. We’re happy to feature Crystal from our Billing Department in this month’s employee spotlight. Crystal is a Billing Team Lead and has been a member of the 180 Medical family for eight years as of this month! Take some time to learn a little more about Crystal and some of what she does as part of her job here at 180 Medical. Crystal, we’re excited to feature you on the blog this month since it’s your 8 year anniversary with 180 Medical! How do you feel your time here has helped you in your professional development? All of my supervisors have always been very helpful, and they have offered training and proper career development needed to perform my job well and prepare for advancement within the company. Management here is very encouraging about taking on new tasks and stepping out of your comfort zone to accomplish success. I would tell them this will be the best job they have ever had! 180 Medical has a fun and friendly environment, and I feel like they really care about their employees. You get to work alongside great people, and there are great benefits too! What’s a fact about you that people might be surprised to know? Most people are surprised at a couple of jobs I had when I was younger. I was probably one of the youngest lunch ladies ever! When I was 21, I worked in the OKC Public Schools Cafeteria, and I was also a mail carrier for a couple of years in my early 20s. What’s an average day in the life for you in your position? What are some of your main responsibilities? As a Billing Team Lead, I am responsible for helping answer questions that employees in my department may have, and I also help to resolve any issues with claims processing, I keep our billing manual up-to-date so that we always have the most current insurance requirements and guidelines in place to follow. In addition, I provide training sessions to help the billing specialists keep up with changes with various insurance plans and department processes. My specialty is more on the various state Medicaid plans, and this sometimes requires a lot of research since Medicaid plans are sometimes very complex and detailed, but that’s great because I really enjoy doing research! What’s something you really enjoy about working at 180 Medical? Among all the great perks, I really love going to our quarterly meetings. They are always entertaining and full of laughs, and it’s also great to see people get rewarded for their hard work throughout each quarter. 180 Medical encourages employees to take the time to focus on our customers and give extra effort, and I appreciate that. To me, having the freedom to go above and beyond to help people who need us is a great feeling! I am pretty laid-back and simple, so the thing I enjoy most is just spending time with my wonderful family. I have 8 great nieces and nephews and 1 grand-baby that I love getting to spoil. Thanks to Crystal and all of our awesome employees in the Billing Department. We appreciate all of the work and care you put in every day at work, and your contributions are so important to 180 Medical. Are you interested in becoming a part of the 180 Medical family? We’re hiring! Check out our available positions and apply today. Working at 180 Medical is not just a job; it’s a fulfilling career where you get to help others and go to a workplace you love. Find out more about Cassandra, one of our Product Specialists, and her role at 180 Medical in our latest employee spotlight!